pwned experiments: Beer cup vs. acetone. 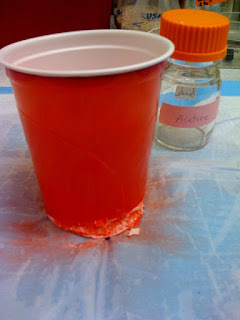 "An undergrad in the lab thought it would be a good idea to put his acetone waste in a red plastic beer cup from the kitchen. What the F**K was he thinking? Perhaps we'll never know..."
My 2nd year biochem lab partner washed his plastic curvette with acetone. He then asked the lecturer what had happened. Who stopped the whole class to announce "Washing a plastic curvette with acetone means the curvette is no longer a curvette!". Much pointing and laughing followed.